When thinking about aging, it’s essential to be honest about what it means for running performance. After you turn 30, every time you add a candle to your birthday cake, your absolute performance potential diminishes just a bit. But that doesn’t mean you can’t keep improving. In 2014 Darrin Banks, then 48, finished California’s famed Dipsea race in 58 minutes 11 seconds. Two years later, at age 50, he finished the steep, seven-mile event in 54 minutes 20 seconds. According to the Dipsea’s complex head-start scheme, which gives runners a head start based on their age and gender, Darrin’s absolute performance potential in 2016 should have been a full minute slower than in 2014. In reality, though, he finished the 2016 race four minutes faster than he had in 2014. Those four minutes translated into 4th place overall, up from 27th in 2014. The logic behind the Dipsea system is perfectly well reasoned: over the age of 50, physiological inertia trends toward a loss of strength, a decrease in bone density and reduced hormone production. But there are countless other runners like Banks who have bucked the trend. 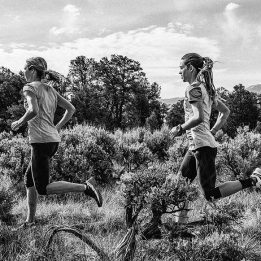 Just as pediatricians are told not to think of children as small adults, runners over 50 should not simply think of themselves as young runners with a few more gray hairs; but with a smart training strategy, they can still chase performance gains. Apply these five training principles to make up the head start given to your younger competitors and then some. Many 30-year old runners can get away with fast, ego-boosting runs nearly every day; almost no runners over the age of 50 can. So, while all runners should be doing most of their running at an easy, aerobic effort, it’s especially important for runners over 50 to do so. Heart rate is a good way to keep yourself from going too fast. For younger runners, the crude calculation of 180 minus age is a helpful guidepost. However, in my coaching experience, the formula underestimates fit runners over 50 and tells them to run slower than they need to. In lieu of lab testing (which is the best option): a simple approach is to run a two-mile time trial, finishing with an all-out sprint for the final minute or two, preferably slightly uphill to minimize impact forces. That number should be close to your max heart rate. Then, in the morning, take your resting heart rate. Subtract resting from max to get your heart rate reserve. Zones one and two, where you want to do most of your training, are 60-80 percent of heart rate reserve, plus your resting heart rate. Most aerobic training should fall at the lower end of the spectrum, to further reduce injury risk. If you don’t want to mess with a heart rate monitor, just jog at an easy, conversational pace. If you can sing along with your music or curse along with your news podcast, you should be fine. Planned off days allow the body to rebuild and stop injuries in their tracks. Mark thrives off a five-day training week with two rest days. Four days may be optimal for some runners over 60, and three days may be best for runners over 70. Since your running time may decrease as you age, it is helpful to have a no-impact cross-training option. I ask all my athletes over 50 to have a stationary bike trainer, which affords an aerobic workout without much injury risk. Focus on high cadence (90-plus) at all times, which seems to translate better to running. Due to natural reduction in aerobic capacity with age, focusing solely on VO2 max intervals (approximately an all-out 10-to-15-minute effort like many people use for short hill repeats) while aging is kind of like trying to form a bucket brigade to stop the rising tide. You’ll see more improvement from focusing most of your workout energy on easier intervals around lactate threshold (approximately an all-out one-hour effort) or a slightly faster critical velocity (approximately 30-to-40-minute effort for most runners). In practice, athletes over 50 can thrive off of total work intervals of 10 to 30 minutes at critical velocity to lactate-threshold effort once or twice a week (using hills reduces impact forces). That time can be chopped up in a number of different ways, like 8 x 2 minutes or 2 x 15 minutes, depending on goals and background. Mark excels doing workouts like: 20 minutes easy, 5 x 3 minute hills (1-to-2-minute easy recovery), 20 minutes easy. Another workout: a short warm-up, followed by 30 minutes at lactate threshold on the Manitou Incline, the famous uphill grind in Colorado Springs, Colorado. The key is not to go too hard. Target an effort you could hold for 30 minutes to an hour, rather than one that stops you in your tracks at the end of each interval. Strength loss due to aging can not only be counteracted, it can be reversed. Short hills between 20 and 30 seconds are a double whammy, building strength while simultaneously improving running economy (the amount of energy it takes to run a given pace). One of my athletes, Nancy Thomas, finished 2nd at the U.S. Cross Country Championships for the 45-plus age group using what I call “Nancy’s Hills.” Three or four times a week at the end of an easy run, she would do 8 x 20 second hills, starting at a bound—or slow, loping strides—and working into a relaxed sprint. These hills are easy and fun, and support faster running during workouts and races. In addition to short hills, moderate strength training like push-ups can improve muscle strength and even have positive effects on bone density. 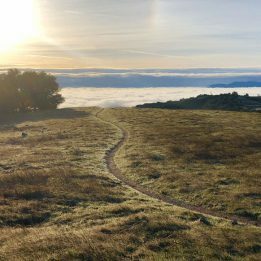 A 30-year-old pro training for peak performance in a 100-miler might do 10 runs between 20 and 29 miles and four runs over 30 miles in training. 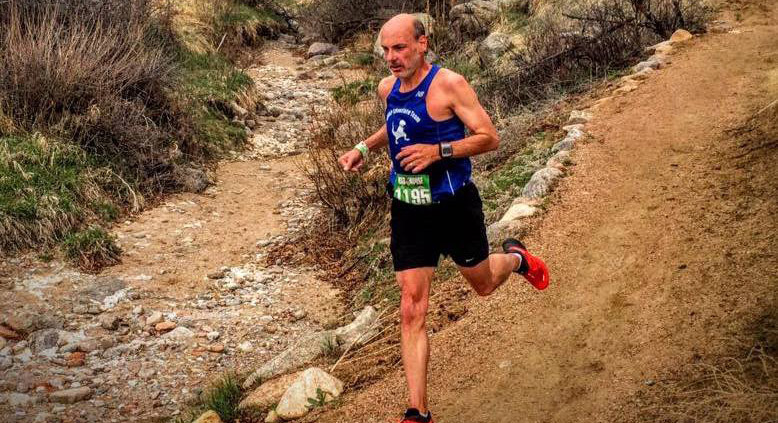 An elite 60-year old might be better off doing three runs between 20 and 29 miles, one 50K and one 50-miler, with big efforts and full recovery. In other words, instead of focusing on quantity of race-specific stress, focus on quality of race-specific stress, since every stress dose increases injury risk. Most training should be general and focused on building lactate threshold (hills), aerobic strength (as many easy miles as possible given your background) and running economy (hill strides). However, there is no substitute for specific training. The three rules that work for my athletes are to spread these key training sessions out by at least a week or two, make them count to provide the exact stimulus we are looking for and treat them with respect by taking more recovery than usual before and after. Father Time spares no one. You will get older and you will get slower. But with smart training, you can spend a few decades giving your biological clock the middle finger. Certainly hits the mark for me. I’m 56 YO runner. Did mostly road running til meniscus tear surgery last March. It’s been a long time to get back it seems like. What helped me thru the injury and recovery was listening to my body. The “old horse” wanted to get back out on the road but switched to elliptical. Went over to trails as the pounding even with hills felt less than the road. Also, adding a 3X per week strength/core has pushed me back without 95% of the pain. Rest is so important too. Thank you so much for that comment Keith. The listening to your body element is huge. If you have any other suggestions, let me know! Good article David, thanks. At 52 I know I listen to my body a lot more and it talks back a lot more. Definitely less or more spaced out interval/speed work these days compared to when I was younger. But I’m still running/riding and still enjoying and staying fit and happy with that. So awesome Robert! You have many decades left of joy out on the trails! If any of you have suggestions of things that worked for you (or your athletes if you’re a coach), I’d love to hear them! This area of training philosophy is less settled-on than some other things, and your stories really matter to me and TR. Thank you! A very welcomed article, Dave. We codgers (I’m 56) appreciate age-specific guidance. I’ve learned that warming up and regularity in training are more important than ever as I age. And, cooling down with eccentric calf exercises has worked wonders in keeping Achilles tendonitis at bay. As my doc said ” if you follow the rules, you can run for many, many more years”. I’m still shooting for PR’s. Everett I agree! Being consistent in training has been the most important aspect of my improvement. And hill strides! Love this Everett! A great tip for a future article! This is a much delayed response but here is my 2¢. Have been running or doing triathlons since I was a teenager (now 58). Interval work has always exhausted me (seriously even when I was 30 yo) but respond well to strides (thanks David!) as well as about 30 minutes/week of tempo. Interestingly no problem running 6 days a week. Don’t do weights, except 10 squats and 10 split squats per day. A few lunges and push ups and lots of stretching and foam rolling. What keeps me strong and healthy is running easy miles. Thanks for the discussion of older runners. I’m 72 this month and am having some success in holding it all together on the trails. Running at 180 minus age (plus a few), a low carb no sugar diet, along with some trigger point therapy self-work seems to work. I am trying not to lower my event goals (‘Never last-but close’), but just being out there and running (albeit sort of slow) is really all I need. I love it when I get ‘Geezered’ by someone even older than me! You are incredible! So awesome! Such a cool approach William! The PRs definitely depend on when a person started. Thank you for sharing! Good stuff. 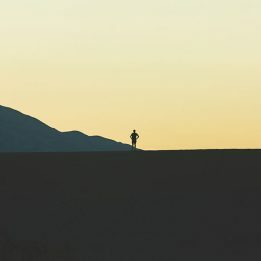 I’m new to ultrarunning (been barely a year since my first ultra) but 45, so I’m starting to really pay attention to how aging affects my racing and training. I have read that you get some number of years of continual improvement as a new ultrarunner (5, 7, 10- depending on the source) so I’m on the upswing there, but I’m also approaching 50- so I’m on the downswing there. It will be interesting to see how I can balance those two trajectories. You have years and years of progression ahead! WOOHOO! I am 53 next week. I have signed up for a series of sprint distance triathlons (800m swim, 20K bike, 5K run) this summer. I did the same series most years from 2009-2014. I find that by mixing the three I can avoid the issues with “just running”. I’m ready on the swim (as I swim three days a week at lunch) and will be hitting the bike and run these next three months. Wish me luck. ALL THE LUCK! That sounds like such a fun journey! That is great stuff Rick! I love your approach. Fascinating!! I love this experiment of 1. Sounds like you are doing some amazing things that work for you! Read Steve Magness on strength training for runners. Agree with your comment that you are not alluding to any science here, as this type of routine has no basis in the current thinking of strength training, especially for runners or other aerobic athletes. Strength is best developed by using near maximal weights for very few repetitions. Using weights that allow for 50-80 rep sets do not develop strength, nor are they of any aerobic value. HI just finished reading the book “The First 20 Minutes” where some scientific research indicated that lower weights/higher reps was very beneficial for increasing strength and power perhaps moreso that the traditional method as menioned above. Either way I reckon any weight / resistance training done properly has got to be good for the runner. Nice to see an article for those of us who are older runners. I’m 62 and noticed a drop off in pace and endurance about two years ago. Frustration and desiring a better performance is a tough combination. This gives me a guide to try to see if improvement is still possible. Thanks for this timely topic. It gives me hope. Thank you Spike! Be patient with your body–the regression comes in ebbs and flows, but you can push back and take advantage of what your body will give you. You rock! But how do you check the ego and memories of days that seem not so long ago? I struggle daily as this year Father Time has apparently caught up to me and I can’t seem to find my elite running level again. Cross training has help- but I’m starting to fear I may have to walk away for a bit to get a reality check. That is a great question Tom. I guess the main lesson is that ego always backfires, whether a person is 70 or 17. The universe eventually puts ego in its proper place! You rock! Agree with this 100%. Cultivating gratitude is a key to happiness in any activity. I only wish more folks could grasp this somewhat elusive idea. Fantastic article David! Absolutely love reading your work and as a 50-year-old runner enjoyed this particular piece even more. Thank you!! That means so much to me Jacque! Thank you so freaking much! You are awesome! Thanks for teaching us old dog some new tricks. Hi David, I’m 48. With the kids growing up, i find that there is probably less stress than there was say 10 years ago and there’s less pressure on time available for running. The key for me is always having a goal. And frankly, when we’re out on the trail which one of us, whether 48 or 68, doesn’t feel like they were 18!!?! Good advice and something to incorporate into my training. Started running at 52 and did all the wrong things like trying to PR my training runs. Just turned 59 and have since learned how to avoid major injury and even train and race through the minor stuff. A big help was The Mind-Body Method of Running by Feel by Matt Fitzgerald. Good piece David, thanks! I use to run 130 miles on average a week for a great part of the year when I was young (20 to 40 years). I am 68 years old now and still do 100 miles on average a week (minimum 85 and maximum 115 miles). Most of it I do easy. My experience is that volume does not do much damage but to much speed/quality does. However to run this type of mileage takes a lot of time. The key is you must enjoy what you are doing.